The P.F. Chang's experience is a unique combination of Chinese cuisine, attentive service, wine, and tempting desserts all served in a stylish, high-energy bistro. Philip Chiang was born in Shanghai and grew up in Tokyo, before relocating to San Francisco. In the early 1960s, his mother opened, The Mandarin, one of the first Chinese restaurants in the United States to serve Chinese food from regions other than Canton. The Mandarin became widely known for its high-end cuisine and eventually led to a second location in Beverly Hills. After graduating with a B.F.A. at the Art Center College of Design in Los Angeles, Chiang ran The Mandarin for several years before opening an off-shoot concept called the Mandarette in West Hollywood. As a smaller, less expensive caf�, the restaurant served �grazing food� which became an immediate hit and attracted the attention of restaurateur and Mandarette customer, Paul Fleming. After successfully opening Ruth�s Chris Steak House in Beverly Hills, Fleming was looking for a new opportunity. In 1992, Chiang agreed to consult on a Chinese restaurant in Scottsdale, Arizona, where Fleming had recently relocated. One year later, the first P.F. 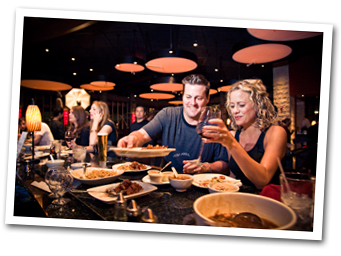 Chang�s China Bistro opened and today there are over 200 locations worldwide. In his current role, Chiang acts as a culinary consultant to ensure P.F. Chang�s remains true to the restaurant�s original vision of creating great craveable food that guests cannot get anywhere else. He also oversees new dish development and is responsible for the current menu.